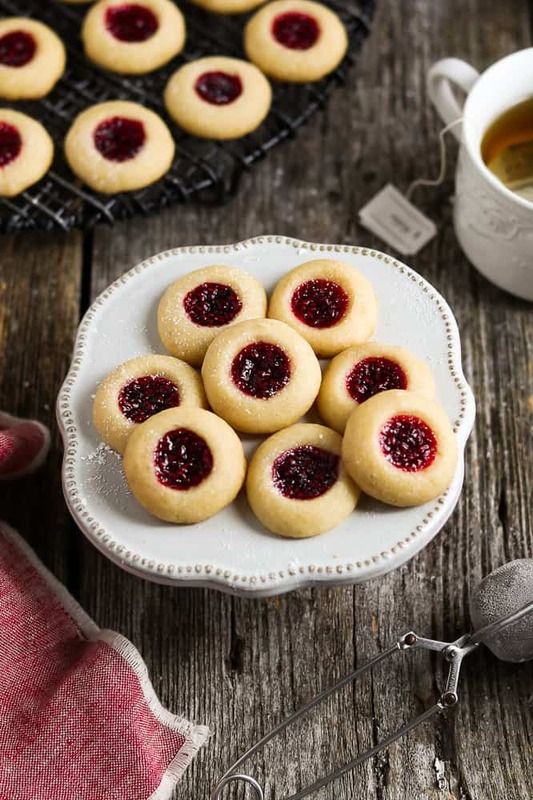 Vegan Thumbprint Cookies – The combination of tart jam and a buttery-sweet crumb is pure bliss in every bite. ‘Tis the season for everything festive and sweet! I’m up to my ears in cookies and I couldn’t be happier! 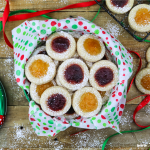 My go-to holiday cookies are these Jam-Filled Vegan Thumprint Cookies. I give them out every year along with Hot Chocolate on a Stick and Cookies in a Jar. They bring tons of smiles and that’s what matters. This recipe was posted back in 2016 and I felt it needed fresh new photos and easy-to-follow instructions. The cookies are still amazingly delicious! First, whisk the flour and salt together and set aside. Now add slightly softened vegan butter to the bowl of a Stand Mixer and beat until creamy. Add the sugar and beat until incorporated and scrape down sides as needed. Add the vanilla and almond extract then mix until combined. On low speed, gradually add the dry ingredients and mix until dough starts to form. *Don’t over mix. Add almond milk and mix on low to combine. Scoop the dough and roll it into smooth ball-shape. Place on your baking sheet about 1 1/2 ” apart. Make the indentations by using the back of a 1/4 teaspoon and press down gently about 1/2 way in. Spoon jam into each well using a small spoon or you can pipe it in. Now bake in the oven until barely lightly golden about 13-15 minutes. Baking too long will make them crispy. Carefully check the bottom of one cookie – it should be lightly golden. Let cool on pan for 10 minutes before transferring them to a cooling rack. Tip: I found that the dough cracked less if I made the indentation right after rolling each ball, instead of rolling them all first. If you do see a few cracks, just gently smooth them out with you finger or just leave them be. Small cracks are completely normal and add character. 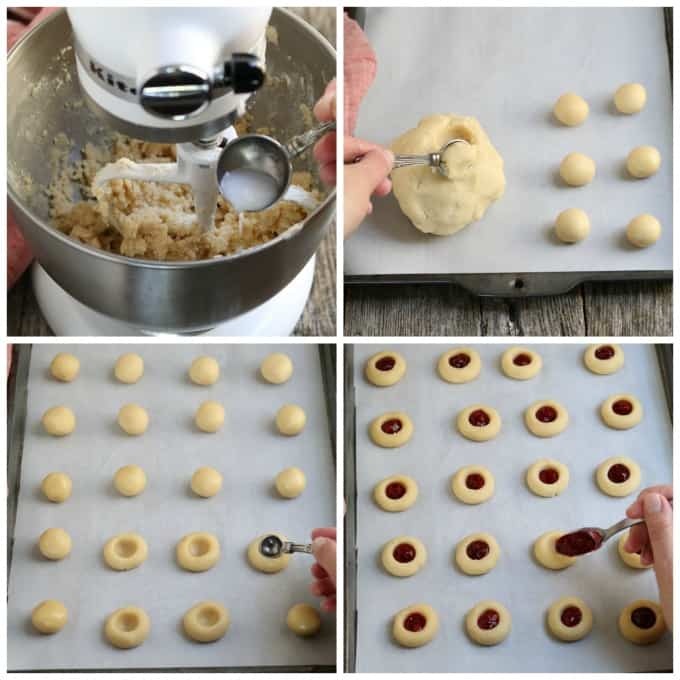 Do I need an electric mixer to make Thumbprint Cookies? No, you can do it all by hand and the cookies will still be delicious. They might be a hair less fluffy, but it’s not a notable difference. STEP 1: You’ll need to soften the butter enough that you can work with it by hand. However, you don’t want it to be melty. STEP 2: In a medium bowl, whisk the flour and together. Set aside. STEP 3: Place the butter in a large bowl and break it down with a wooden spoon or silicone spatula. Mix it for about a minute to get a creamy texture. STEP 4: Add your sugar and mash it together with the butter using a large fork. Now, start whipping it until it’s soft and fluffy. Add the extracts and whip to combine. STEPS 5: Add the flour into the butter/sugar mixture and mix until just combined (don’t overwork). Add the non-dairy milk and mix until a dough is formed. If it’s too dry or crumbly, add another teaspoon of milk. Now you can make the cookies following the instructions in the recipe card. Do I need to chill cookie dough? That’s the million dollar question! Most of the time, it’s safest to do so. Especially, if the recipe calls for it. However, I rarely chill the dough for this recipe. I work fairly quickly and never feel that my dough is too soft. I use a Marble Pastry Slab to keep it cool while I’m rolling the balls. If by chance the dough feels soft or sticky, I’ll wrap it in cling wrap and chill for 15-20 minutes. If the dough isn’t rolling easily into a ball shape or holding its shape, then the dough is too soft and you should chill it. Are you guys ready? Let’s do this! 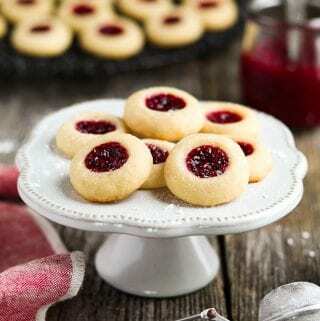 If you make these Vegan Thumbprint Cookies, let me know what you think by ★ star rating it and leaving a comment below. It would really make my day. You can also follow me on Instagram and share your creation with me. Just tag me @veganhuggs and hashtag #veganhuggs so I don’t miss it. 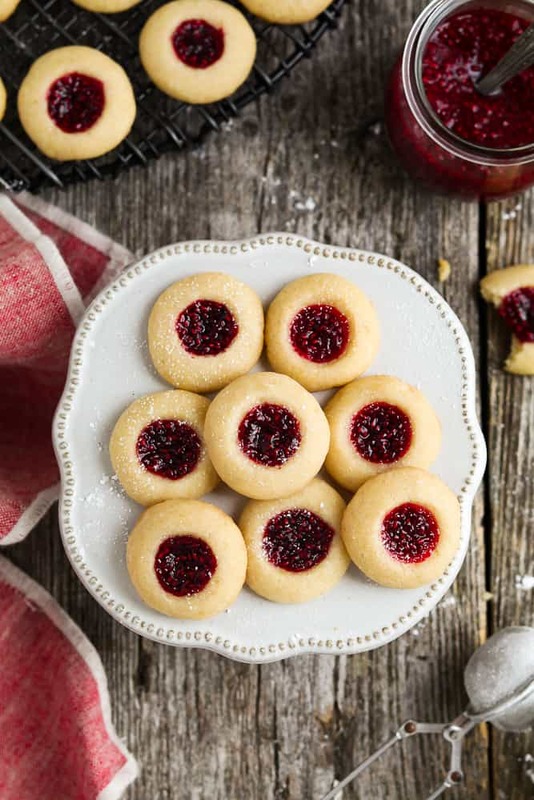 Vegan Thumbprint Cookies - The combination of tart jam and a buttery-sweet crumb is pure bliss in every bite. Preheat oven to 350°F (177 °C). Line 1 extra large baking sheet (or 2 medium) with parchment paper. Set aside. In a medium bowl, whisk flour and salt together to combine well. 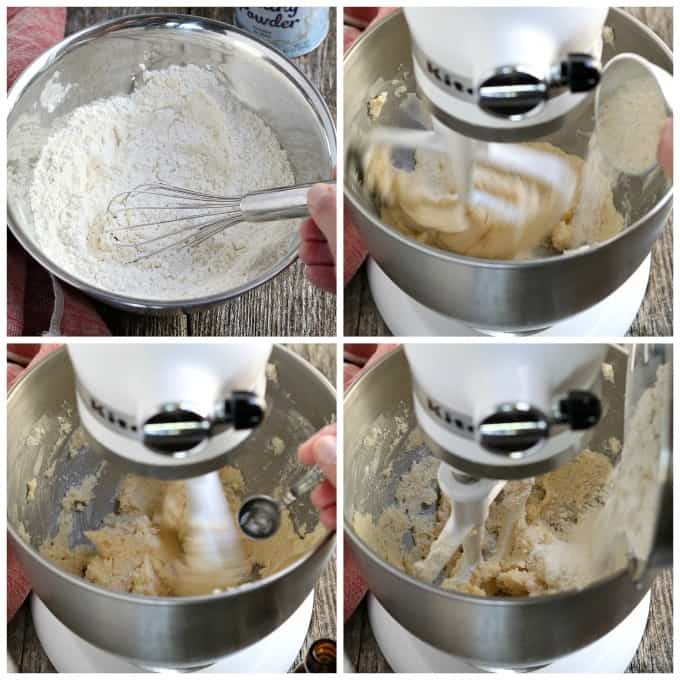 Add the softened vegan butter to the bowl of a Stand Mixer and fit with a paddle attachment (or use a medium/large stainless steel bowl with a Hand Mixer). Beat on medium until creamy for 30 seconds. Add the sugar and beat on medium until incorporated (about 30-60 seconds). Scrape down sides as needed. Now add the vanilla and almond extract and mix on medium until combined (about 30 seconds). Turn to low speed and gradually add the flour and mix until just combined and dough starts to form (about 30-60 seconds) *Don't over mix. Scrape down sides as needed. Now add the 2 tablespoons of almond milk and mix on low to combine. Using a half-tablespoon measuring spoon, scoop the dough and roll into smooth balls. Then place them on your baking sheet about 1 1/2 inches apart (try to keep the dough around the same measurement for even baking and prettier cookies). 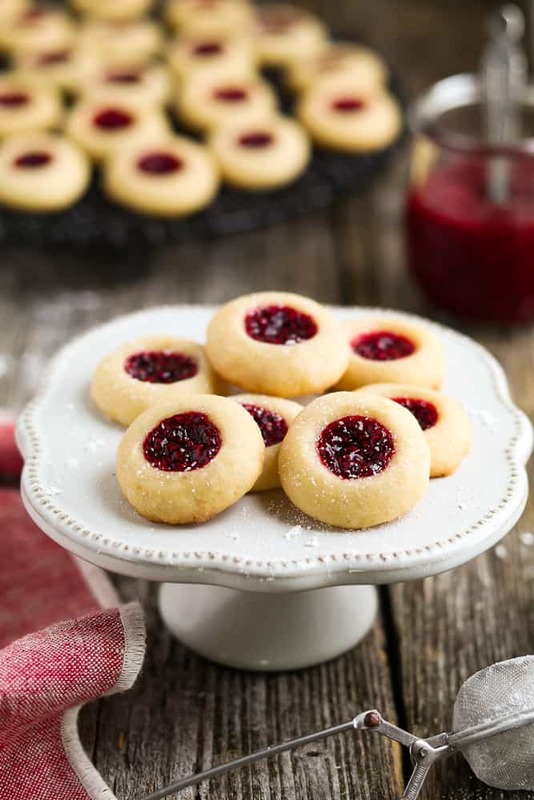 Using a small spoon (or piping bag), fill each cookie with jam (don't overfill or it will spill out during baking). Bake in the oven until barely lightly golden about 13-15 minutes (baking too long will make them crispy). Carefully check the bottom of a cookie - it should be lightly golden. Remove from oven and let cool on baking sheet for 5-10 minutes before transferring them to a cooling rack for another 10 minutes. Dust with powdered sugar if desired. For accurate results, don't scoop the flour with a measuring cup directly from the flour container. Instead, scoop the flour out of your container with a spoon and then into a measuring cup. Don't pack or tap the cup. After filling, lightly sweep a butter knife across the top to remove the excess flour. * Example photo below recipe card. If your dough is too soft or sticky to work with, wrap it in cling wrap and chill for 15-20 minutes. The dough will soften again as you're rolling the balls. Make sure the dough balls are smooth to avoid cracking. 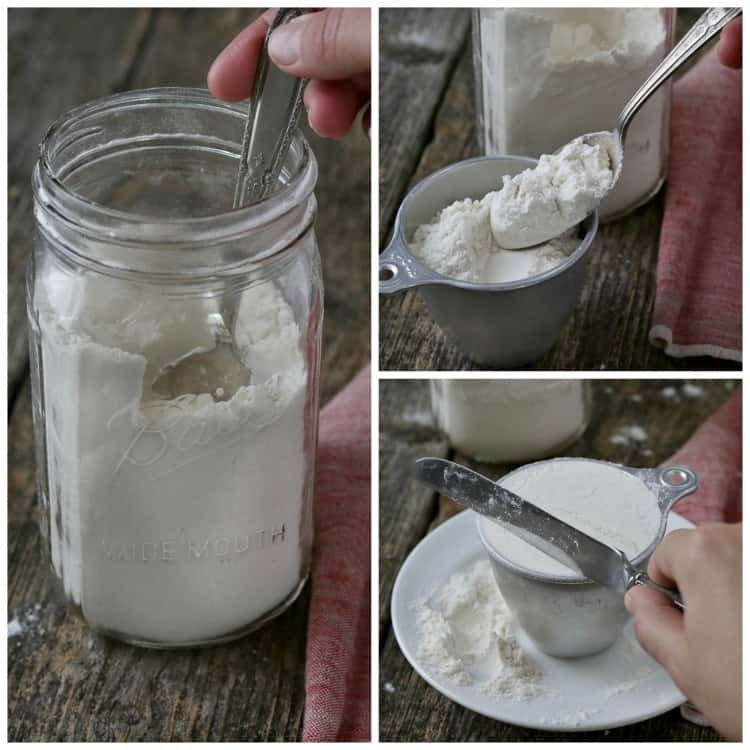 If your dough is dry or crumbly, you can add 1/2 teaspoon of non-dairy milk and gently work it in until just combined. Add more if needed. Keep stored in an airtight container for 5-7 days. I found that the dough cracked less if I made the indentation right after rolling each ball, instead of rolling them all first. If you do see a few cracks, just gently smooth them out with you finger or just leave them be. If you don't have an electric mixer, check post above for instructions. Can I substitute almond for white flour 1:1? I was looking to try and make the cookies for Passover by using almond flour. 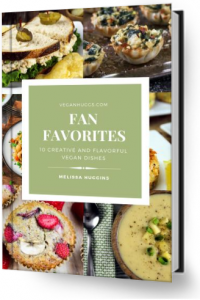 I can’t wait to try this recipe but I don’t live anywhere where vegan butter is available, is there any other substitute that will like oil or something? I never comment on recipes, good or bad, but I had to let you know, I absolutely loved these cookies, and so did everyone that ate them. The almond extract really makes them. They’re buttery, and all around my new favorite cookie (to eat and bake). Only thing I couldn’t manage to do was make the cookie part look as pretty as yours. Tips? Again, thanks for the fantastic recipe! This is such a nice compliment – thank you so much! I love the almond extract too and I use it in a lot of baked goods (just a small amount). I was wondering if we can make those with chocolate spread instead of jam? Thank you so much for sharing this recipes :-)!! Do you have a recipe for chocolate ganache? Warm milk and oil over medium heat in a small saucepan. Add chips and stir until melted. Let cool slightly then fill into baked cookies. The ganache will harden up as it cools. Is it possible to freeze the baked cookies? 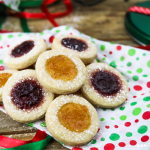 I used ginger raspberry jam for a little interesting flavor twist. Also, the first cookies I’ve ever made that got better with time, as the jam makes the cookie part just a bit moister after a day or so. Question: could I use this same dough to make those Linzer cookie sandwich type things? Or would it be too soft? 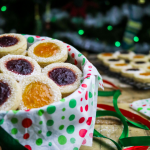 Yes, you can make them into a Linzer-style cookie. Usually, they are made with part flour and almond flour. I’m going to post a traditional recipe soon (hopefully before Valentine’s Day). Have a Happy New Year! Made this yesterday and they were delicious! I’m about to make another batch but I just noticed something. In the instructions at the top, it says to mix flour, salt, and baking soda (step 2). But in the recipe card and the instructions listed under the ingredients, there’s no mention of baking soda. Could this be why my cookies yesterday ended up cracking a lot? They were still delicious and they held together just fine, but lots of cracks. Hi Sarah, the original recipe did have 1/2 teaspoon of baking soda in them. I guess I forgot to delete that. However, I omitted it because I felt they didn’t need it. You can still add it if you’d like though. If the dough is overly cracking, then it may be too dry. I would add a small amount more of vegan milk to the dough if that happens. Also, roll the balls until they are very smooth and then make the indentation right away. Press down very gently. Also, make sure to measure flour with the spoon and level method to ensure you don’t get too much flour. In the next batch, you can add 2 more tablespoons of softened butter to the recipe and that will help with cracking. You may not need any milk at this point, see if the dough comes together and add if needed. I hope this helps. Thanks for making them. What is the best vegan butter to,use? I’m new at this. I typically use Earth Balance sticks for buttery cookies. Can you find that near you? I just made this and they turned out perfect! I usually stay in my comfort zone and make chocolate chip or peanut butter cookies. Silly me! Thanks for the recipe, they are the perfect afternoon delight.